Street parking, driveways and home garages are generally forbidden in this experimental new district on the outskirts of Freiburg, near the French and Swiss borders. Vauban's streets are completely "car-free" -- except the main thoroughfare, where the tram to downtown Freiburg runs, and a few streets on one edge of the community. Nothing that bold, that we know of, is in the works in the Portland area. But in California, the Hayward Area Planning Association is developing a Vauban-like community called Quarry Village, just outside Oakland. Residents will be able to access the Bay Area Rapid Transit system on foot or bike. California State University's campus in Hayward also will be nearby. 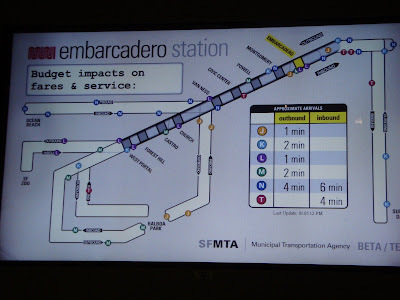 In other news, I posted earlier about the service reduction on San Francisco’s Muni Transit system; the San Francisco Bay Guardian has an article on fixing transit. For this to work, public transit must be not just a little bit better, it must be a great deal better. It must remain affordable for families and serve the whole city efficiently, at all hours of the day. Residents should need cars so rarely that transit costs, plus occasional car-sharing and car rentals, are cheaper alternatives than car ownership. With a higher gas tax and tolls on freeways (measures a recent San Francisco Planning and Urban Research analysis shows to be among the most cost-effective policies to reduce greenhouse gas emissions), we can make public transit work better. SFMTA should implement its proposed rapid network on the routes that carry 80 percent of Muni's passengers, speeding up the vehicles by at least 20 percent. That will cost car drivers some time: mixed traffic lanes will have to be converted to bus lanes. Turns will have to be restricted and parking will have to be removed.